The researchers have begun mapping shipwrecks in the only freshwater national sanctuary, using imaging technology that's getting its first full-fledged, deep-water workout by the National Oceanic and Atmospheric Administration, which manages the 4,300 square-mile Thunder Bay National Marine Sanctuary with the state of Michigan. They are rapidly creating accurate 3-D images of the sunken vessels by feeding a series of photos into a software program. Researchers have been photographing and shooting video of the wrecks for years, but until now lacked the ability to quickly, accurately and cheaply create more illuminating 3-D images, particularly with the limited budget and time they have on dives of at least 130 feet. The new images are a great benefit, allowing them to assess and monitor the wrecks with a precision that can detect even minute changes over time. "This is the first project we've really rolled it out on," said Joe Hoyt, the diver in charge of the imaging technique known as photogrammetry. "The cool thing about this is it's photo-realistic but it's also perfect 3-D, so you're seeing all sides of it. And it's perfectly scaled. It's a really amazing, accurate tool for measuring and monitoring, and the biggest benefit is the time it takes to develop is very, very small." Among the highlights was a trek down to the Defiance, a 110-foot schooner that sunk in 1854 after colliding with the John J. Audubon. One of the sanctuary's earliest wrecks, it sits nearly 200 feet below the surface a few miles off the coast of Presque Isle, a community in Michigan's northeastern Lower Peninsula. The archaeologists marveled at its "amazing" preservation - deck hardware and cabins intact, masts still standing - as if the Defiance could set sail if only it resurfaced. Hoyt described it as "a storybook wreck - what you'd imagine a shipwreck to look like but never is." It is an ideal test subject for the 3-D imaging technology, which could become standard for analyzing shipwrecks everywhere. Before donning his wetsuit, tanks and grabbing his camera, Hoyt detailed his image-capturing itinerary with fellow divers and other crewmembers: "My plan is to start up at the bow and (go) at a 45-degree outboard angle, do a total sweep around the entire thing," he said. "When done, I'll drop down to bottom near the bow and get some of that, then do sort of an arc down the center line of the whole thing." "Pay attention to where I am and try not to be in (the shot)," he added. With limited time at the wreck due to the depths, Hoyt set to work and managed to cover all the ground in under a half-hour. He credited the "well-oiled machine" of the experienced team - most with anchor tattoos - and great visibility that allowed him to see "all the way across the wreck." The Defiance was one of three mid-19th century schooners within a few miles of one another that were given the photogrammetry treatment over successive days. The team found the Windiate and Spangler as well-preserved as the Defiance. Within minutes of returning to the sanctuary's Alpena offices, Hoyt went to work on his laptop aligning dozens of images, pixel by pixel. He was soon producing rough cuts of the 3-D images. The unprecedented accuracy of the new images they are developing will be useful not only for archaeological assessment and monitoring, but also for giving the general public a broader understanding of wrecks that are otherwise inaccessible to everyone but experienced deep divers. "I could certainly see a large, touch-screen, flat-screen in our exhibit, with a half-dozen shipwrecks to choose from," said Russ Green, a fellow dive-team member as well as the sanctuary's research coordinator and deputy superintendent. Or, he envisions, a 3-D printer as part of a display that "prints out a shipwreck of your choice" while words and images describe it. "We've done animation and renderings, but this could allow someone to truly explore a shipwreck site," he said. The sanctuary protects and monitors roughly 100 known shipwrecks and is working to discover and document dozens more in its newly expanded territory. For divers, bringing new imaging-capturing technology into what once was known as "Shipwreck Alley" also moves them into new territory. 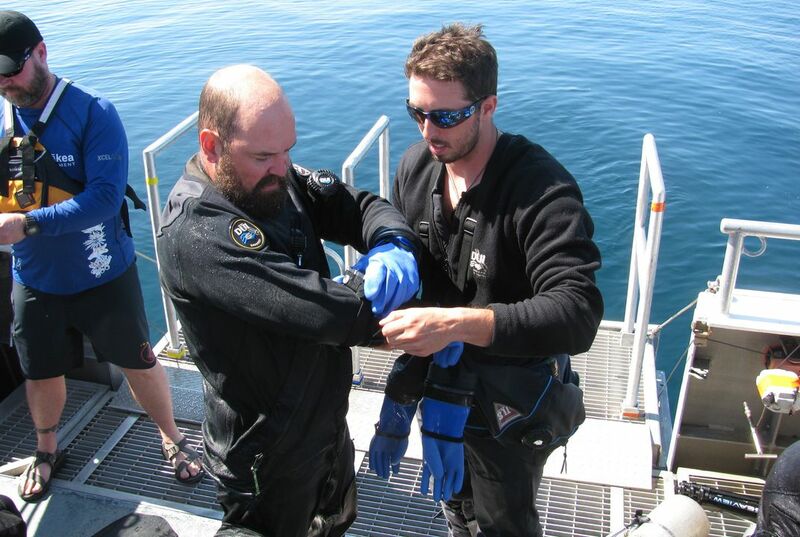 "People don't have ... a solid understanding of what the value of these sites are, but (that changes) when you can bring it in a 3-D manner," said Ryan Bradley, a support diver and graduate student at East Carolina University. "This technology allows average citizens to get a better understanding of maritime heritage. ... This is America's history. It's still there, it's preserved and it's amazing." Why do 3-D images provide more information than two-dimensional images? 3D imaging is more more beneficial to that of 2D imaging for a lot of reasons, such as it requires less time and work to cover all parts of your specimen or object, as well as 3D imaging tends to show more detail like depth. It is useful in this case because you can see the ship at different angles and make a better analysis of what went wrong, or where the ship failed or even hit something. From a labor standpoint it takes less time to photograph the entire ship (but you can do much more at the same time). Also, you can have multiple views of the ship in one 3D image whereas 2D you are much more limited. 3D imaging creates more opportunities for analysis, which makes the job and search for clues much easier. I really like this article about 3-D imaging of ships because I love maritime history. I found this article interesting because it not only shows the advancements in technology,but it also shows the process of exploring shipwrecks. I think eventually they will be able to just simply scan a ship wreck and 3-D print it out. What I wonder though, is if we can use this technology combine it with 3-D Printing and map out the surfaces of other planets or un-explored sea floor. I really enjoyed this article and hope they do more articles like this. 3-d imaging can provide some serious details for discovering hard to reach areas or maybe an area that may be to dangerous. This can help people accurately describe structures of where there going so they may not have a hard time struggling to find what they are looking for. I think this can help a lot of people in the nearby future. This shows the improvement in technology and I cannot wait to see what they will come up with next. This is a really interesting article because 3-D has become so wide spread that we can almost do anything with it. The fact that they have divers going down to take photos and videos of a shipwreck and having a 3-D model not long after is just amazing. It really shows how far we've come when it comes to technology. If they can figure it out, they could make these public and make millions of dollars on "tours." 3-D images show a better image because it can show the whole view of the boat in 3-D. It can also show how the boat sank. It is also safer for divers because they do not have to dive under water. The 3-d image can also discover holes in the boat that divers could not see under water. 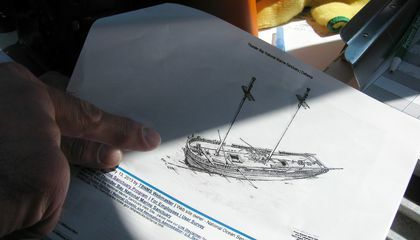 3D images provide the full scale of the shipwreck. These images give insight into hidden treasures in these historical shipwrecks. 3D technology also helps other people understand the maritime heritage. These images give the smallest details in order to know how big these ships and whats inside of them. This technology also helps the divers with what they are looking for.Two dimensonal only helps to know what the ships used to look like. Three dimensional images provide more information because you can see how tall it is and see the whole ship, not a picture for one side and a picture for the other side. 3-D images provide more information than 2-D images because in 3-D you can see all of the details on the object/image.